Rhythmic gymnastics grew out of the ideas of Jean-Georges Noverre (1727–1810), François Delsarte (1811–1871), and Rudolf Bode (1881–1970), who all believed in movement expression, where one used dance to express oneself and exercise various body parts. Peter Henry Ling further developed this idea in his 19th-century Swedish system of free exercise, which promoted "aesthetic gymnastics", in which students expressed their feelings and emotions through bodily movement. This idea was extended by Catharine Beecher, who founded the Western Female Institute in Ohio, United States, in 1837. In Beecher's gymnastics program, called "grace without dancing", the young women exercised to music, moving from simple calisthenics to more strenuous activities. During the 1880s, Émile Jaques-Dalcroze of Switzerland developed eurhythmics, a form of physical training for musicians and dancers. George Demeny of France created exercises to music that were designed to promote grace of movement, muscular flexibility, and good posture. All of these styles were combined around 1900 into the Swedish school of rhythmic gymnastics, which would later add dance elements from Finland. Around this time, Ernst Idla of Estonia established a degree of difficulty for each movement. In 1929, Hinrich Medau founded The Medau School in Berlin to train gymnasts in "modern gymnastics", and to develop the use of the apparatus. 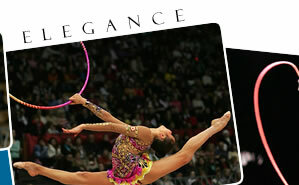 Competitive rhythmic gymnastics began in the 1940s in the Soviet Union. The FIG formally recognized this discipline in 1961, first as modern gymnastics, then as rhythmic sportive gymnastics, and finally as rhythmic gymnastics. 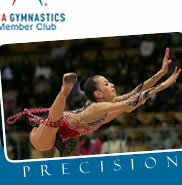 The first World Championships for individual rhythmic gymnasts was held in 1963 in Budapest. Groups were introduced at the same level in 1967 in Copenhagen, Denmark. Rhythmic gymnastics was added to the 1984 Summer Olympics in Los Angeles, with an Individual All-Around competition. However, many federations from the Eastern European countries were forced to boycott by the Soviet Union. Canadian Lori Fung was the first rhythmic gymnast to earn an Olympic gold medal. The Group competition was added to the 1996 Summer Olympics in Atlanta. The Spanish group won the first gold medal of the new competition with a team formed by Estela Giménez, Marta Baldó, Nuria Cabanillas, Lorena Guréndez, Estíbaliz Martínez and Tania Lamarca. Olympic rhythmic gymnastics is only for female participants. 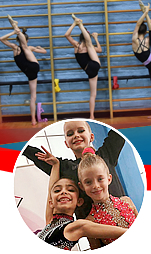 Girls start at a young age and become age-eligible to compete in the Olympic Games and other major international competitions on January 1 of their 16th year (For example, a gymnast born December 31, 2000 would be age eligible for the 2016 Olympics). Gymnasts in Russia and Europe typically start training at a very young age and those at their peak were typically in their late teens (15–19) or early twenties but since 2004 it is common to see gymnasts achieving their peak after reaching their twenties, some gymnasts are highly competitive in their early twenty or late twenties for example were or are Yulia Barsukova, Sylvia Miteva, Almudena Cid, Liubov Charkashyna, Aliya Yussupova, Aliya Garayeva, Delphine Ledoux, Anna Bessonova, Evgenia Kanaeva. Top rhythmic gymnasts must have many qualities: balance, flexibility, coordination, and strength are some of the most important. They also must possess psychological attributes such as the ability to compete under intense pressure, in which one mistake can cost them the title, and the discipline and work ethic to practice the same skills over and over again. The FIG selects which apparatus will be used in competitions; only four out of the five possible apparatuses are sanctioned. Up to 2010, the clubs were not used at the Senior level. For 2011 rope will be dropped for senior national individual and group competition. In 2011, it will be dropped for junior national individual competition but return again in 2015. 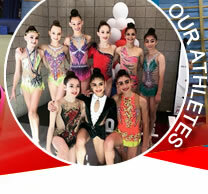 Rope appears in Junior National group competition in 2011-2012. Ball: It is made of either rubber or synthetic material (pliable plastic) provided it possesses the same elasticity as rubber. It is from 18 to 20 cm in diameter and must have a minimum weight of 400g. The ball can be of any colour. The ball should rest in the gymnast's hand and not rest against the wrist or be able to be grasped. Fundamental elements of a ball routine include throwing, bouncing or rolling. The gymnast must use both hands and work on the whole floor area whilst showing continuous flowing movement. The ball is to emphasize the gymnasts flowing lines and body difficulty. Hoop: A hoop is an apparatus in rhythmic gymnastics and may be made of plastic or wood, provided that it retains its shape during the routine. The interior diameter is from 51 to 90 cm, and the hoop must weigh a minimum of 300g. The hoop may be of a natural colour or be partially or fully covered by one or several colours, and it may be covered with adhesive tape either of the same or different colour as the hoop. Fundamental requirements of a hoop routine include rotation around the hand or body and rolling, as well as swings, circles, throws, and passes through and over the hoop. The routines in hoop involves mastery in both apparatus handling and body difficulty like leaps, jumps and pivots. Ribbon: It is made of satin or another similar material cloth of any colour, it may be multi-coloured and have designs on it. The ribbon itself must be at least 35g (1 oz), 4–6 cm (1.6–2.4") in width and have a minimum length of 6m (20') for seniors and 5m (16.25') for juniors. The ribbon must be in one piece. The end that is attached to the stick is doubled for a maximum length of 1m (3'). This is stitched down both sides. At the top, a very thin reinforcement or rows of machine stitching for a maximum length of 5 cm is authorized. This extremity may end in a strap, or have an eyelet (a small hole, edged with buttonhole stitch or a metal circle), to permit attaching the ribbon. The ribbon is fixed to the stick by means of a supple attachment such as thread, nylon cord, or a series of articulated rings. The attachment has a maximum length of 7 cm (2.8"), not counting the strap or metal ring at the end of the stick where it will be fastened. Compulsory elements for the ribbon include flicks, circles, snakes and spirals, and throws. It requires a high degree of co-ordination to form the spirals and circles as any knots which may accidentally form in the ribbon are penalised. During a ribbon routine, large, smooth and flowing movements are looked for. 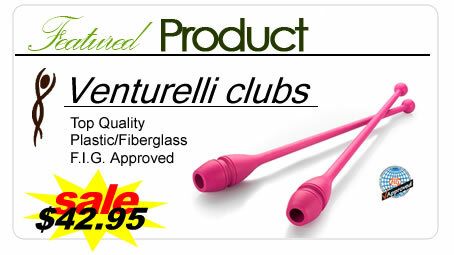 Clubs: Multi-piece clubs are the most popular clubs. The club is built along an internal rod, providing a base on which a handle made of polyolefin plastic is wrapped, providing an airspace between it and the internal rod. This airspace provides flex, cushioning impact, making the club softer on the hands. Foam ends and knobs further cushion the club. Multi-piece clubs are made in both a thin European style or larger bodied American style and in various lengths, generally ranging from 19 to 21 inches (480 to 530 mm). The handles and bodies are typically wrapped with decorative plastics and tapes. The skills involved are apparatus mastery and body elements, Clubs are thrown from alternate hands; each passes underneath the other clubs and is caught in the opposite hand to the one from which it was thrown. At its simplest, each club rotates once per throw, the handle moving down and away from the throwing hand at first. However, double and triple spins are frequently performed, allowing the club to be thrown higher for more advanced patterns and to allow tricks such as 360s to be performed underneath. Rope: It may be made of hemp or a synthetic material which retains the qualities of lightness and suppleness. Its length is in proportion to the size of the gymnast. When the middle of the rope is held down by the feet, both ends should reach the gymnasts' armpits. One or two knots at each end are for keeping hold of the rope while doing the routine. At the ends (to the exclusion of all other parts of the rope) an anti-slip material, either coloured or neutral may cover a maximum of 10 cm (3.94 in). The rope must be coloured, either all or partially. It may be either of a uniform diameter or be progressively thicker in the center provided that this thickening is of the same material as the rope. The fundamental requirements of a rope routine include leaps and skipping. Other elements include swings, throws, circles, rotations and figures of eight. In 2011, the FIG decided to nullify the use of rope in rhythmic gymnastic competitions.